Since its inception Al Inshirah Islamic Center has shown and taken great strive to living up to its mission, “To cultivate for humanity a model community based on submission to the will of Allah (SWT)”. This would not have been possible with out its strong members and the leadership that moved this community forward. As the newly elected resident Imam I have had the distinct pleasure of being born and raised in this community and have witness the outstanding leadership from its members and leaders first hand. Muhammad the Prophet said, “No matter how small the task is, if it involves more than one person, choose you an Amir.” With this in regard we would like to recognize one of the many great leaders among us, Imam Rudolph Muhammad. He has not only worked with members of the community, he has also helped to implement plans and programs that will enrich the lives of those around him. His leadership and organizational skills have been invaluable to many of our programs. For example; his relentless effort along with the support and hard work of the believers within our community, we as a community overcame the challenge and were able to payoff the mortgage on the entire property with our “Capital Campaign Fundraiser”. Allahu Akbar! This fundraiser was a major step forward for the members of Al Inshirah Islamic Center and its future generation to move forward in the right step. As Resident Imam my goal is to continue to move this community forward in the right direction paved by the leaders who have came before me and the many leaders we have amongst us for the betterment of our community. Great leaders build and transform others to become leaders. Within our membership we have many great leaders who lead daily and follow when needed. As a community our vision is to be a catalyst for lasting change by developing leaders who serve for the good of all humanity. 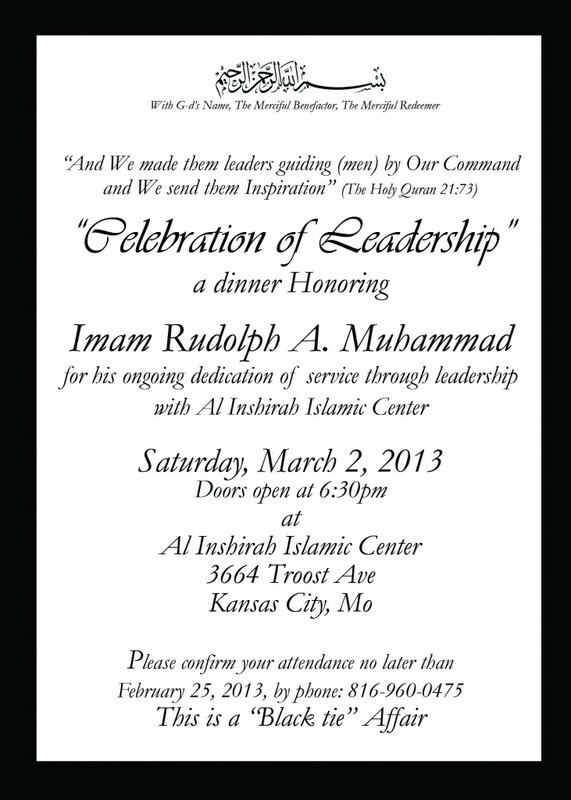 It is with great pride that on March 2, 2013 we invite you to attend Al Inshirah Islamic Center’s ” Leadership Awards Banquet”. This banquet promises to be a very beautiful and elegant event, with the hard work and event planning of sister’s Shahidah Hazziez and Aisha Muhammad, combine with the catering of Chef Lufti Khalifah and the help of others, this event is not to be missed.